Most people do not experience negative effects from caffeine in small doses, but some people are more sensitive than others. If you have a health condition such as high blood pressure or heart disease, your doctor may recommend that you avoid caffeine. If you are highly sensitive to caffeine, you may be concerned about eating white chocolate or using lotions or creams that contain cocoa butter. Caffeine is the most popular psychoactive drug in the world. People all over the globe consume caffeine as part of their daily routine. It increases alertness and helps reduce drowsiness. Caffeine is also a muscle relaxant that is used medicinally to treat migraine headaches and asthma. It is also a mild diuretic and can cause insomnia, headaches, stomachaches and dizziness when used in excess. According to guidelines published by the South Dakota Department of Health, 300 mg of caffeine per day is a moderate amount for most adults. Some people are more sensitive to caffeine than others. If you are accustomed to taking large amounts of caffeine, your body may have built up a tolerance to the drug, and you will notice that you need more caffeine to experience the same stimulant effects. Cocoa butter is the fat portion of the cocoa nib. Cocoa nibs contain about 54 percent fat. During processing, the cocoa nibs are reduced to a paste called chocolate liquor, which may be pressed to remove some or all of the cocoa butter, or it may be mixed with sweeteners and milk solids to create chocolate. Cocoa powder is chocolate that has had up to 75 percent of the cocoa butter removed. Cocoa butter is often mixed with sweeteners and milk solids to create white chocolate. The name is a misnomer because it does not actually include cocoa nibs. Cocoa butter also is a common ingredient in skin creams and some hair care products as well. The naturally occurring caffeine in the cacao plant is concentrated in the nibs of the bean. 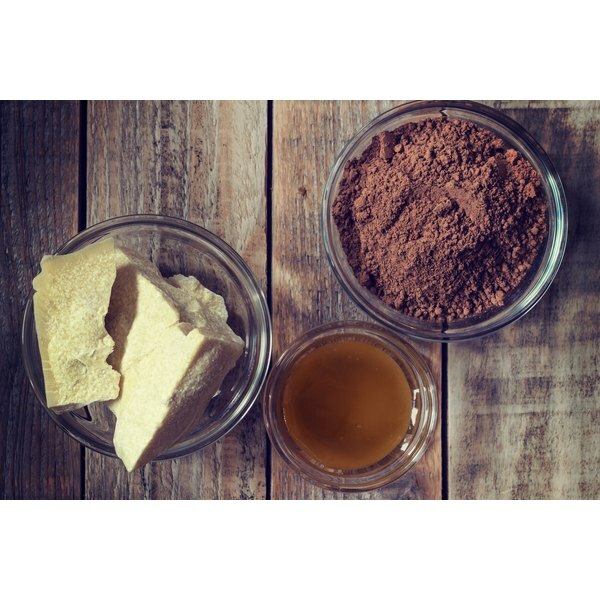 When the cocoa butter is pressed out of the chocolate liquor, the cocoa solids and the caffeine are left. Cocoa butter is the pure fat of the cacao bean. It does not contain caffeine. Because white chocolate does not contain cocoa solids, it does not contain caffeine either.